It’s sure hard to take a good picture when you’re holding a baby in one arm. Anyway the pattern is Yarn Harlot’s Unoriginal Hat . 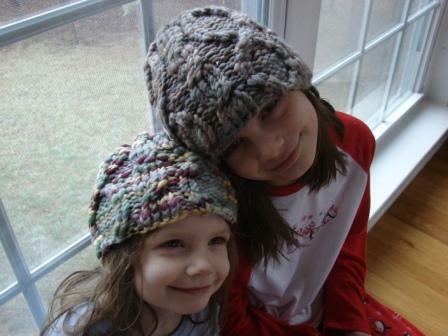 I worked it up on size 8 US dpn’s (had to go down a few needle sizes so they’d fit their little heads) and the yarn is Blue Moon Fibers’ Leticia in colorways Scottish Highlands (Neve, on left) and Downpour (Emily, on right). I wish the colors had come out better here. I’m going to have to start breakin’ out the photo lamps. It’d also help to have 2 hands! Anyway the hats fit them really well and are very warm. While I was knitting them I was thinking how I’d like to knit up a cabled throw blanket out of it. I still may – maybe just one or two squares at a time – in different colors, like a patchwork quilt. That would be fun actually……………..now the gears are turning! We got ice last night so schools are closed today. It’s nice to have Emily around to help out with the baby a bit but she and Neve tend to fight a lot so…..it’s a trade- off. Maddie will be over later to spend the night so I’ll have more help – the girls tend to behave better when she’s around (she might not believe that!) so it makes my life easier. With Mads around I should be able to get some cleaning done as well, and maybe make a big batch of spaghetti and meatballs for dinner. If only she never had to go to school………..